One of our guests today said “I think Jackman forgot to get the memo that Spring has arrived” 😆 I believe this is a fact. Driving around town today, I cannot believe the amount of snow we still have. I took this shot of our front entrance to the office/lobby. 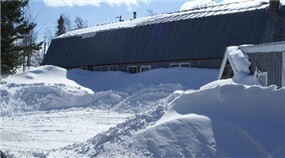 Yes, there is a door and an OPEN sign on the door behind all of that snow. Soon we will be looking at the beautiful lake like the guy on the snapshot above! Cabin #5 gets a redo! Although many of our guests LOVED Cabin #5, “”””No Name”””” and told us not to change a thing, we know that it does need to be updated. SO last week, the demolition began. As the walls came down, we found that it was added to about 3 times; a true new englander camp! This does give it character but also makes it very long and narrow. Although we have some of our own ideas on it, we thought we would ask you, our guests, as to what you would like to see in this cabin, or if anyone out there is creative or an architect and has a thought, bring it on! We would appreciate the input. The basic outline of the structure is below. We are at a point that we can do anything to it except move the toilet, which is the bullseye on the drawing. It-s location is about 7 feet from the front (lakeside) of the cabin and about 3 feet from the wall. 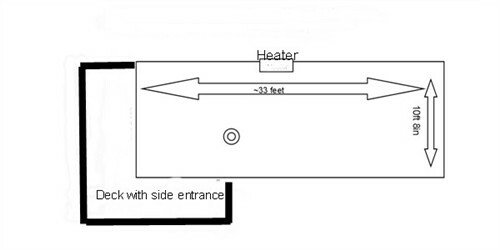 We want to make this a 4 maximum cabin, perhaps using a futon or daybed set up instead of twin bunk beds. If you have any thoughts on it and want more information on dimensions or size of needed items, send us an email. I did find a site through Better Homes and Gardens that makes it fun to design. Go to this link and give it a try. If you come up with an idea, send us an email. Our webcam is now live. 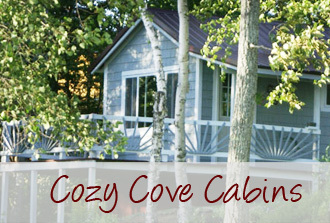 Go to our homepage at [url=http://cozycovecabins.com]Cozy Cove Cabins[/url] to get a sneak peak at the happenings here. The only view you have is on our driveway, cabins 3 and 4 and in the distance you can see Big Wood and the mountains behind that. Eventually, we plan to mount this closer to the shoreline. SO over the next few months, depending on when the snow melts 😆 , the cam may be moved to different places. We hope that this helps our guests see what-s happening here at Cozy Cove! Bigwood Lake Webcam coming soon from Cozy Cove Cabins! Ever since we came to Cozy Cove Cabins, our families have been telling us, “”””you should get a webcam so we can see what the weather is doing or watch ICE OUT or see the lake…”””” etc. Then our guests started asking us for the same thing. So finally, we listened and we have a webcam. The camera is not set up outside yet nor is it accessible to anyone yet but it is all in the works and will be available soon. We have some bugs to work out with connecting it to our website plus we may need to wait for a weather change to secure it outside. 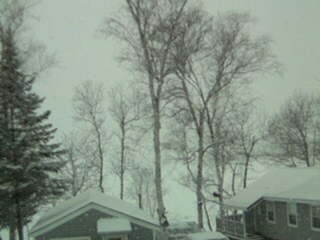 The picture above is a snapshot from the video camera taken this morning. It was snowing really hard at that time plus it is looking through double pane glass window (it is set up in our house) so although it looks pretty dark, it is not a bad picture. Remember when 50 seemed old to us? It really does not anymore. 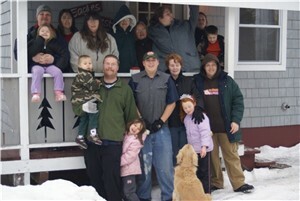 Below is a shot of a family who came to Cozy Cove for their Christmas holiday. What fun the kids all had sledding down the hill and everyone being together. This is what Christmas is all about. Being around those you love and sharing the time together. Best wishes to everyone this holiday season! Well we had another beautiful couple take their vows here this summer… John, Jen and their son shared the moment together on August 24th. 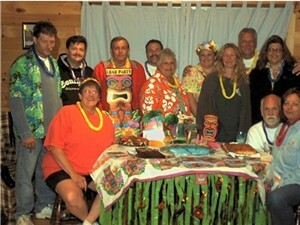 A group of 12 friends came to Jackman for their vacation this year and one theme they planned was for a Luau. Of course, Mother Nature chose to give Jackman the same major storm as Hawaii had that day (what a storm came through here just at dinner time!) and the Luau had to be moved inside. But that did not stop the fun, the decorations or the festivities. They played Don Ho music and everyone got “”leied”” 😉 on arrival to the cabin. This is the group shot of them. They are already planning for next year and the 2nd annual Luau! PHOTO UPDATE-The bride and groom have finally let all of their family know about the wedding so this is a shot of the happy couple. We wish them the best of luck in their lives together! On Sunday, we had our first couple get married here at Cozy Cove Cabins. They really wanted to marry down by the lake but the weather reports were all saying “”big thunderstorms on Sunday””. I think everyone-s prayers were answered. It was just a little overcast but no rain…then the sun even came out the rest of the afternoon. It was a lovely small simple ceremony performed by someone in town. Steve and I stood up with them as their witnesses; best man and matron of honor. I was honored that they asked us to do this with them. Although the bride brought her wedding dress, she chose to dress simpler in a white cotton dress but she did wear her veil plus the necklace and earings her Mom bought for her. While Steve was down by the lake with the groom…keeping him distracted, I helped the bride set her veil and apply those last personal touches. I cut one of my white lilies for her and tied it with a blue scarf (her borrowed and blue). The groom wore a blue shirt and trousers. This was an elopement so we cannot show any photos yet but I will get one up after they get a chance to get home and tell everyone. Best wished to the newlyweds!